During a future energy workshop that I attended recently the audience heard from Professor Jorgen Randers, from the Center for Climate Strategy at the Norwegian Business School. Although Professor Randers has been involved in scenario planning for many years, he introduced his lecture by saying that it was time to just do a realistic forecast of what is “going to happen” and be done with it. He held out little hope for any sort of coordinated global action on emissions, which basically meant that the world would just have to come to terms with its higher atmospheric CO2 future. What was interesting though was the forecast that he then proceeded to give – it certainly wasn’t the runaway apocalypse that some will have us believe we are in for. I should say that Professor Randers earnestly thought we need to do better than this, he just couldn’t see how it might come about. The forecast he presented is available on his website (www.2052.info). He uses a very small number of key metrics to establish his outlook, but takes a different view on how they might develop. The starting point is population, which he sees reaching a plateau of 8 billion in 2040, at the low end of UN forecasts (but not outside the forecast) . This is because of declining fertility rates as women increasingly move into the workforce and seek careers. As the existing population ages the global death rate increases as well. This population trend is, not surprisingly, a critical assumption for his forecast. The next key assumption is that global GDP will begin to slow down, linked in part to the population assumption (the number of people in the 15-65 age bracket actually falls after 2035) and a second critical assumption that continuous improvement in labour productivity will eventually end as this metric plateaus (he noted that it has already started to). The result is global GDP also reaching a plateau in the 2050s and beyond. Linked to this is a plateau in consumption which is dampened by the need to spend a non-trivial amount of global GDP on adaptation and reconstruction (coastal cities etc.) as the climate changes and sea levels continue to rise. This latter point is an important self regulating part of the analysis. Randers then turned his attention to energy use, shown in the chart below. 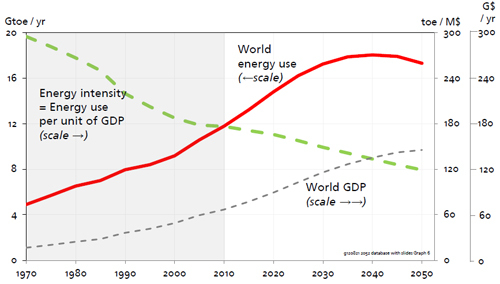 With energy use per unit of GDP (efficiency) continuing its downward trend, global energy use peaks in 2040 and then declines. The energy mix also changes over the period, with renewable energy coming on strongly, oil use reaching a long plateau around 2020 then declining quite quickly and both coal and natural gas use peaking in the 2030s. As a result CO2 emissions peak in 2030 and decline, dropping 10 billion tpa over the subsequent 20 years. All of this then feeds through to an eventual plateau in atmospheric CO2 and therefore temperature. Randers clearly recognizes that we shoot through 2°C, but the end point in his forecast is about 3°C, not the much higher levels of 4, 5 or even 6°C that some are concerned about. In effect, this is now a self regulating system, albeit one that has to deal with significant changes in sea level and other impacts. There was no attempt to endorse any of this, quite the opposite. Randers also noted that some of his assumptions are seen as politically or socially unacceptable, such as the declining birthrate and an eventual plateau in GDP. As such, the forecast itself becomes something of a political hot potato. Whether he is right or wrong isn’t really the point, what is interesting about the analysis is that some very small changes in basic assumptions can have a profound effect on the outcome. Pretty much anybody that has constructed even the simplest spreadsheet with built in growth rates recognizes this, but I hadn’t seen it applied in this manner before. Even though they may be outside our normal expectation, all of his assumptions fall within the bounds of credibility, so the forecast is essentially a valid one. A 3°C world is far from where we are today, but it is useful to recognize that our global climate / economic system is now essentially a single entity and that there may be an outcome which is very different to the alternate vision of “meltdown”. 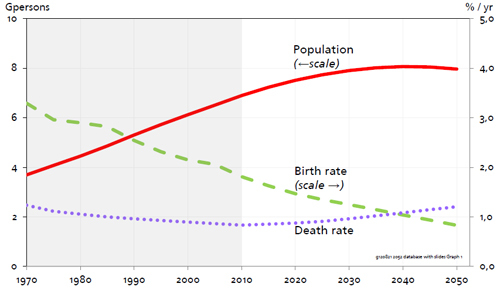 Very interesting model, as it kind of prescribes what is needed: quick drop in fertility rates, quick drop in GDP growth, quick conversion to renewable energy etc. All of these are very ambitous targets. And even then 3C would cause big financial and social costs. In other words, we can avoid total meltdown, but must realistically accept partial meltdown as the best outcome after taking drastic measures to stop eascalating world population and GDP in its current tracks. It seems that the urgency to avoid the worst case scenario by any means necessary (an end to civilization as we know it and the extinction of humanity) should guide us to the highest state of action to begin reducing CO2 immediately. Please read my current series of five letters to Rex Tillerson and consider sharing the few simple messages with Peter Voser … http://bit.ly/AutumnsFall (the 5th and final in the series will be posted Sunday, one week before the Autumnal Equinox). I believe that you and Messrs. Voser and Tillerson would find the call to action compelling. I am not sure I understand this point, which seems to be related to slide 11 (slide numbers refer to the 2012 presentation available at Randers’s website). In slide 11, Randers forecasts an increasing proportion of GDP in “investment.” If this additional investment is related to adaptation and reconstruction to cope with climate change and sea level rise (about 2 feet by 2050), then it would seem to require considerable resource and energy use, perhaps a higher level of resource and energy use than many forms of “discretionary” consumption. 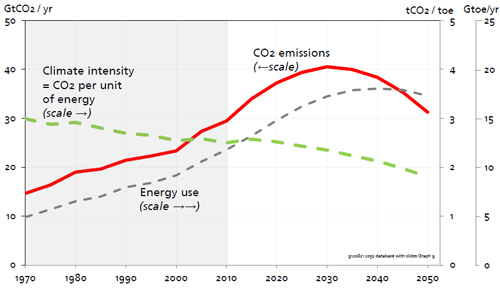 If we project the CO2 emissions graph with a linear decrease beyond 2050, then it seems to reach zero emissions about 2090. Of course, we are dealing with human emissions here, and it is not entirely clear that the biosphere and oceans will continue absorbing roughly 60% of the human emissions as more climate change effects come into play (wildfires, droughts, floods, warming oceans, etc.). Further, how much and how soon other carbon sources (permafrost, benthic clathrates) will contribute to the atmospheric carbon loading is an open question. That the atmospheric CO2 concentration will plateau under Randers’ forecast is clear, but at what level and when is not at all clear. With a simplistic projection and optimistic assumptions, I would expect levels of 550 to 600 ppm around 2100 (see slide 15, where Randers has a steadily increasing CO2 level passing through 500 ppm around 2050). This would most likely mean a temperature increase of 3°C around 2100 with the temperature still rising. Most projections show temperature plateauing several decades after the CO2 level plateaus. But the tone of your description of passing through 2°C worries me. 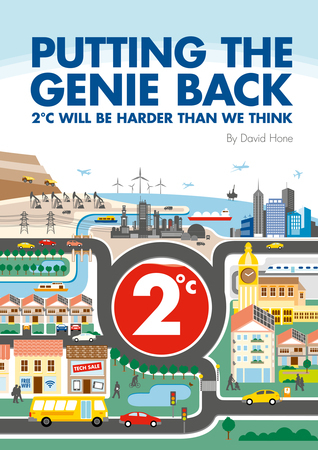 As I understand it, there is not a consensus that an increase of 2°C is okay, rather there is a consensus that an increase of more than that is most definitely very bad. As Randers notes on slide 19 (point 5): “Will this be the end of stable climate? 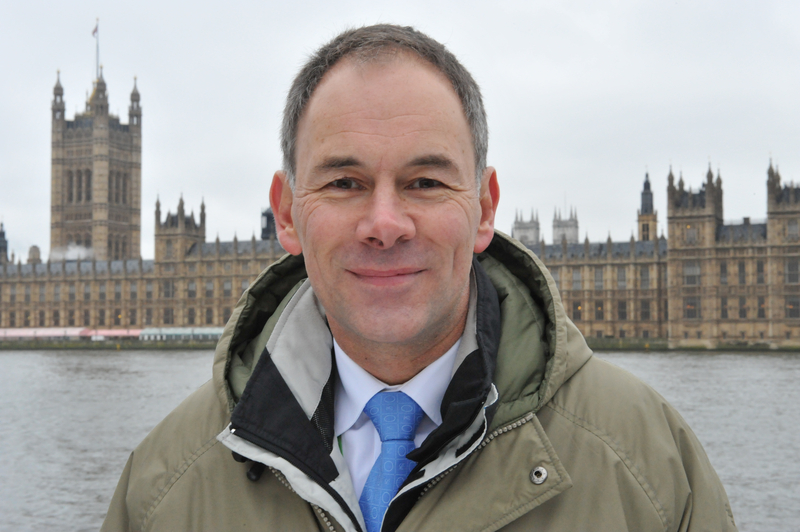 Yes, unless there is extraordinary action.” The end of stable climate means the end of agriculture as we know it today. The end of agriculture as we know it today coupled with an unstable climate and drastic changes in the biosphere (a major extinction event) probably means a drastic reduction of the human population. The conclusion the Randers forecast leads to is that avoiding a “meltdown” requires extraordinary actions now. Both. There’s not much to elaborate on.As a gearnel rule (one that has been followed for centuries), when it is cold outside, wear a coat. When it is warm outside, take the coat off.The Earth’s climate has warmed and it has Cooled, many times over many millions of years with . and without . Man.Don’t let the AGW hippies fool you.